Home / Gift Baskets / Cuddle Up & Celebrate! Decorated with a smile, a singular sunflower is complimented with a red satin ribbon and green trachelium. The Cuddle Up & Celebrate! 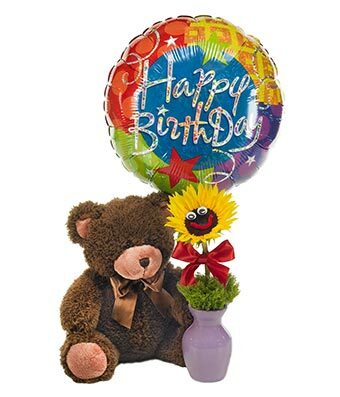 Bouquet also includes a plush teddy bear and happy birthday balloon, making this bouquet bundle complete. Available for delivery in the USA, this makes for an adorable birthday gift for children. Measures 14"H by 5"L.